The eight principal fighters for tomorrow night’s Parker vs. Fury Pay-Per-View card all made weight at today'(see below). Tensions erupt when Fury pushed Parker during the traditional face-off and members of both teams went at it before security broke up the altercation. In a battle of undefeated heavyweight, World Boxing Organization (WBO) Heavyweight World Champion Joseph Parker (23-8, 18 KOs) defends his title against WBO No. 1 contender Hughie Fury (20-0, 10 KOs), airing on Pay Per View in the United States (3:00 p.m. ET / 12:00 p.m. PT start), live from Manchester Arena in Manchester, United Kingdom. “Parker vs. Fury”, promoted by Hennessey Sports, is presented in the United States by Integrated Sports Media and Protocol Sports Marketing, Ltd., in conjunction with an internet-based YouTube PPV that is available at www.youtube.com/parkerfury. Integrated Sports Media will distribute “Parker vs. Fury” live in the United States on cable and satellite PPV via iN Demand, Vubiquity, Sling TV and DISH for a suggested retail price of only $24.95. Joseph Parker(23-0, 18 KOs), Champion, Las Vegas, NV, USA by way of New Zealand 245 lbs. Hughie Fury (20-0, 10 KOs), No.1 mandatory contender, Stockport, UK 234 lbs. Josh Wale (24-9, 11 KOs), Barnsley, UK 117 lbs. Don Broadhurst (19-3-1 (4 Kos), Birmingham, UK 118 lbs. “Jimmy” Kilrain Kelley (21-2, 9 KOs), Manchester, UK 154 lbs. Stiliyan “Still Kill” Kostov (21-7, 16 KOs), Razgrad, Bulgaria 153 lbs. Joe Murray (21-2, 9 KOs), Manchester, UK 137 lbs. Matty Fagan (11-2, 0 KOs), Chester, UK 136 lbs. All and/or highlights of additional PPV fights will air pending time restraints. Fights and fighters subject to change. Hennessy Sports is delighted to announce that BBC Radio 5 Live has acquired the exclusive live radio rights for the WBO World Heavyweight Championship title fight between Joe Parker and Hughie Fury. Parker, the undefeated WBO World Champion from New Zealand, makes the second defence of his title against Fury, the unbeaten and WBO mandatory challenger, at the Manchester Arena on Saturday 23rd September. 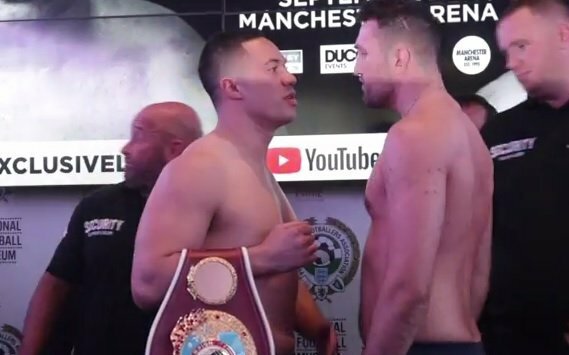 Promoter Mick Hennessy said: “I’m thrilled that BBC Radio 5 Live has secured the radio rights to the WBO World Heavyweight Championship between Joseph Parker and Hughie Fury, and will be broadcasting live from ringside at the Manchester Arena. Kelly’s mild-mannered appearance belies the fact that he can really fight. The 25-year-old has knocked out eight of his 22 victims, with just one reverse on the Wythenshawe man’s ledger – a seventh round defeat to Liam Smith for the Liverpudlian’s WBO light-middleweight belt in December 2015. Kostov should prove a tough and dangerous test for home fighter Kelly, and will be determined to return to his East European base with the WBO strap around his waist. Vastly experienced, the 31-year-old has visited these shores previously, facing former British champion Brian Rose and big-punching Adam Etches. With 16 knockouts from 21 wins, and just seven defeats, the hard-hitter won’t be fazed by the Kelly challenge, but Jimmy says he won’t let the Bulgarian banger wreck his future dreams. “His record suggests he can punch a bit. He’s been stopped a couple of times, but he’s been the distance with the likes of Brian Rose, so he’s quite durable too,” stated Kelly. “He can obviously whack and throws a lot of wide punches, so I need to be wary of his power but I’m prepared and looking forward to it. “I definitely think this could be fight of the night. He’s an all action fighter, comes forward and throws shots looking for the stoppage. He won’t be coming over here to make up the numbers either, and he has his own ambitions to win the title. But I’ve got my own ambitions too, and want to move up the rankings, and get another world title fight. But, yeah, this one could well make fight of the night. *£14.99 in the UK and €16.99 in the R.O.I from Monday 18th September.